The Thomas Brothers Ride for Goats! Kids for Kids supporters and avid cyclists Jamie and Patrick Thomas took part in the Prudential RideLondon to Surrey on 29th July. 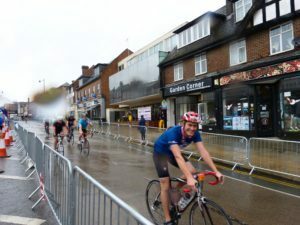 Cycling 100 miles in total, the route began at Queen Elizabeth Olympic Park, went through central London, then down to Surrey’s country roads and the stunning Surrey Hills. Jamie and Patrick cycled back to finish on The Mall, managing an incredible time of 5 hours and 47 minutes – and this was including a tyre puncture! What an astounding effort by them both. Jamie and Patrick raised a grand total of £1,424 for Kids for Kids between them. We are beyond thrilled! This amount will be enough to provide 16 families with Urgent Care Packages, ensuring that they do not starve during the current famine. The rains have just begun in Darfur but these are arguably the worst months of the year, and called ‘The Hungry Months’ by the villages we support. Families are now planting for the harvest but many do not have any seed because they had to eat it earlier in the year when they ran out of food because the previous harvest only produced 10% of what should have been. These packages, which include 90kg of flour, a goat, and 15 kilos of ground nuts for the animals, will save lives. Thanks to the astounding effort of Jamie and Patrick Thomas in both their fundraising and this challenging event, we are able to ensure many children in Darfur will not starve. You are brilliant! We have two spaces secured in the Prudential RideLondon 100 for 2019 – are you interested? Do get in touch to register your interest, or visit our Challenges Page to see what other events you could take part in!